My fantasy is, that when I grow up, I'll be able to sink into this calm place and let go of the need to prove I'm right and they're wrong. (Even when it's obvious!) I'm sure I'll add years to my life and stars to my crown when I get to this place. But here's an intermediate step: asking myself why we differ. No matter what the facts, no matter what the underlying facts are, there must be a reason why my dear relative thinks that the president of the USA is a Muslim who is letting his terrorist friends infiltrate the White House. I can learn something from her. Even if I don't learn more about the president's faith and friends, I can learn about the forces operating to influence this person, and the forces influencing me. From now on, I'm going to try to replace peevishness with curiosity. I'm going to try replacing an incredulous "What??!" (and its many colorful variants) with an honest "Why?" Why do we see the world the way we do? Why do we define our ultimate goals so differently? If our ultimate goals are in fact the same, why are we so unable to tolerate a diversity of methods and paths? Why do I think it's up to me to answer these questions? Thinking about the advantages and limitations of curiosity, I remembered a story Hugh Campbell-Brown once told at Canadian Yearly Meeting. Hugh was the son of Presbyterian missionaries in China. He and his wife Mary were the founders of the Friends meeting in Vernon, BC. The story took place (if I remember correctly) at Pacific Yearly Meeting sessions, during which a Christian missionary in Asia gave a presentation on her Christian faith. After she spoke, a young Friend stood up and said that he found Buddhism to be a more fruitful path. Hugh was impressed that the missionary did not begin a debate on the advantages of Christianity over Buddhism. Instead, she responded, "Tell us what you've learned." To quote a song by Mister Rogers on anger: "I can stop when I want to, stop when I wish, can stop stop stop anytime. And what a good feeling to feel like this, and know that the feeling is really mine. To know that there's something deep inside that helps us become what we can." One of the most important tasks for our curiosity is precisely this: to know whether or not those strong feelings, those temptations to debate, those fantasies of heroic righteousness, are really mine. Remixing the Quaker Tradition in a Participatory Culture... Wess Daniels' book A Convergent Model of Renewal is on sale. Nathan and Richard Foster are making ordinary saints. Wendell Berry's special brand of sanity. Starting tomorrow, visitors to Chicago's Field Museum will learn that Vikings did not have helmets with horns on them. Unfortunately, the nearest Fosters' event to me is the same weekend you and I are at the Friends of Jesus Fellowship Spring Gathering. BTW, is there any way you could enable comments on your blog using the Google Chrome browser? *Sigh* Yes, I know--I have a calendar conflict on the Newberg version, too. Concerning comments on Chrome, I'm not sure I understand. I'm using Chrome at the moment. (But it's Chrome for Linux.) Where is the problem? Can you compose but not post? A couple of compliments, Johan: one, for your use of the Curiosity rover as a starting point, because that makes so many good connections at so many different levels; another, for the story of the missionary, which I agree is delightful. I am always glad to be reminded that there is no single right way to respond to someone who challenges our faith. We’re in a wide-open world, with countless possibilities. Aren’t we blessed! 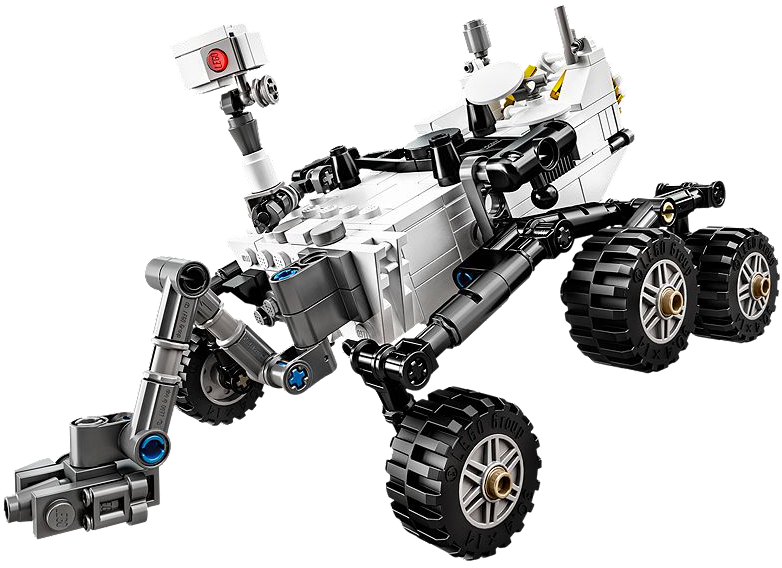 Marshall: I like the particular Curiosity rover that I chose: a Lego toy you have to put together yourself. Thanks for noticing! Triggers & living in reactivity are concerning me lately and so your post is quite timely! Thanks for linking the Wendell Berry interview. I love how you describe it. "Special brand of sanity" indeed.